Interesting app but AutoIt crashed with a "Could not allocate memory" after reading about 3,192 files out of a total of 287,310 during a search for duplicate files over 4 drives. Will play around with some of the other search features to see what it can do. 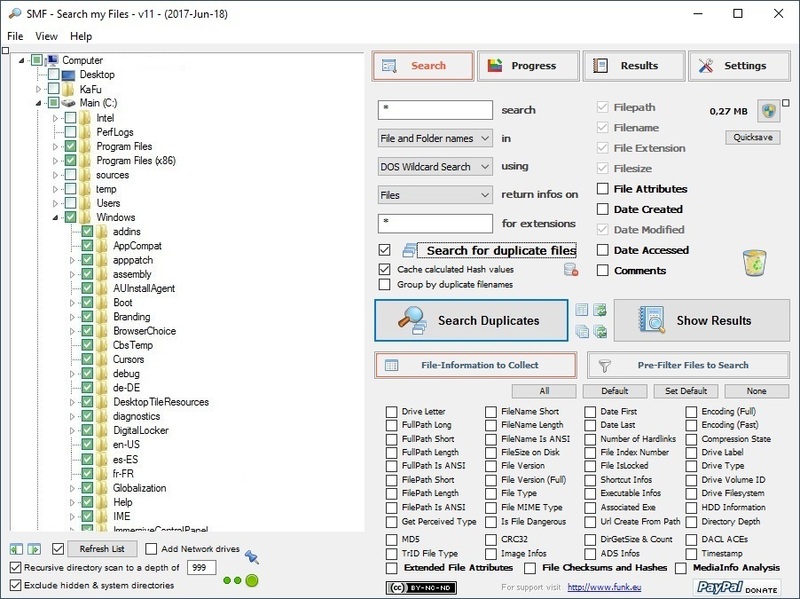 I use CloneSpy to search for duplicate files, IYF for basic file search, and X1 (not free but good) for detailed file searches. This one program might substitute for at least two of those apps if it can handle the volume. Updated to version 1.5... enjoy :)! You're welcome :). Hmmm, what exactly bothers you with the GUI design? Already consumed uncountable hours :). I'll gladly accept specific requests. Somehow I believe that GUI still has room for improvement. What you think kaFu ? After some research I came to the following: I guess you've got a Chinese OS without the fonts "Tahoma", "Arial" and "Lucida Console" which I use in SMF. So the system defaults to the "SimSun" font, which has different dimensions and busted the GUI. I've downloaded that font and see the the fallback-layout in such a case will be acceptable with the next release. "Interface fonts dont scale, which obscures options." New to me. Please send me a message on my Homepage, so we can contact via Email. Would like to see a screenshot of what you mean (for me it looks just like the screenshots on my HP). 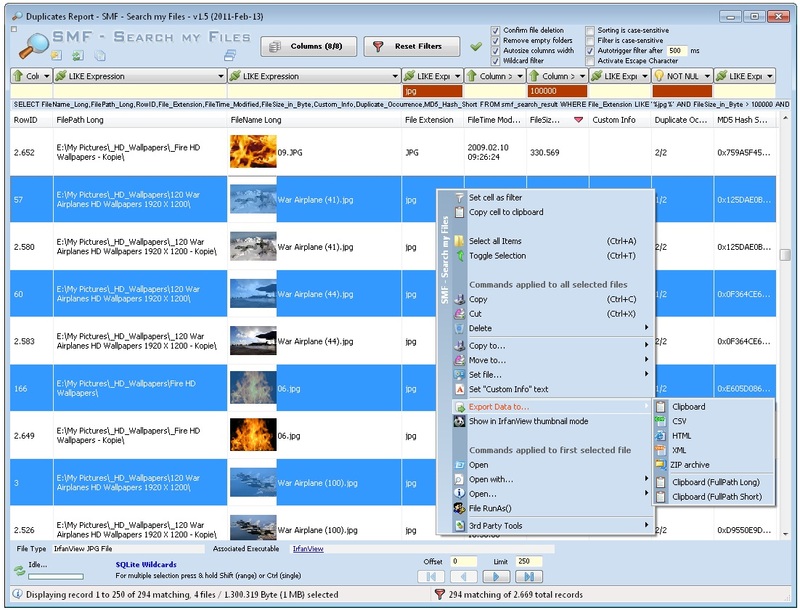 "Program dims other software on display and locksout task switching. Music plays without apparent option to mute." It does.. on the "About" page only. Press Close, hit ESC and everything is fine again. Btw, task switching isn't disable, the About page is just topmost. Weird complications. Interface fonts dont scale, which obscures options. Program dims other software on display and locksout task switching. Music plays without apparent option to mute. This one has potential but needs lots of polishing. And of course, you can't argue with the price. At this point IYF seems like the best of the category, but I wish it could search within search results. The screenshot is when you first start the program. I intentionally did this so users will know what settings to use to 'make Portable' I presume users will visit the site and not download based just on the entry in TPFC. I like this one. Lots of features. The screenshot link at PFC of the install dialog box doesn't do justice to the program. Go to the webpage and see the full screenshots of the program in action. As I mentioned in the forums, I'm looking forward to reviews by more knowledgable users on how this compares to other dupfinders and clean-up tools.